In 1925 the Welsh poet, author and academic Sir T. H. Parry Williams lamented the fact that he had neglected to mention telegraph poles when writing about wires some years earlier. First published in Ysgrifau in 1928, his essay ‘Telegraph Poles’ redressed this omission with a rich and textured celebration of the former trees that had for him “reached the perfect state, which is death, and have commenced a new, static life, which is some kind of death enlivened”. He acknowledged them as being “modern in the extreme”, yet holding “the memory of a monastic Middle Age melancholy in their brutal stance”. Whilst the Welsh language essay alludes to the ubiquitous nature of telegraph poles as being “of the world’s highways”, there is no reference to their role in supporting the essential communication networks of the then burgeoning capitalist societies of the world, including that in Wales. The poles in contemporary Wales support new and rapidly evolving communication technologies that carry significantly more private traffic than in the past. Accessibility to the digital transfer of knowledge and information has not only benefitted developments in commerce, but also challenged the stasis of inclusion and exclusion, continuity and change, emancipation and oppression – in short; it has potentially enhanced the capacity for political and social change. Whilst responding to the political, economic and cultural significance of these utilitarian objects, the photographs of poles also consider notions of visibility/invisibility along with the essential/incidental elements within urban spaces. The photographs can tell us as much about their neighbours as about the poles themselves. The images remind us that we seldom notice the ubiquitous and the necessary unless prompted to do so. Poles and their environments continue to change and evolve and are subject to the shared concerns of the day. 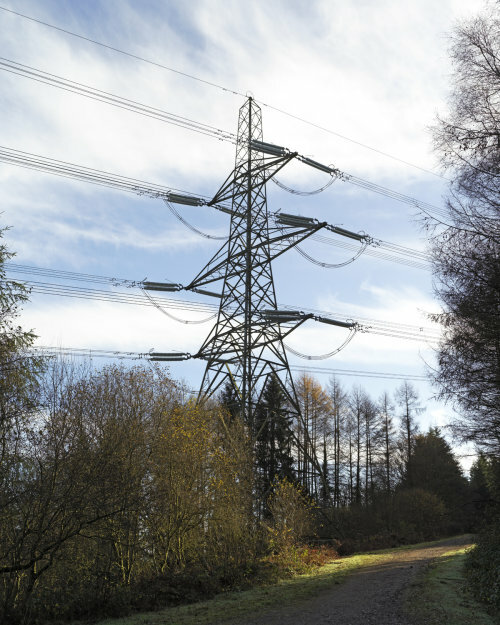 In the 1980s there was a move to reduce the clutter of wires in the streets of Wales, whilst more recently cables have been buried underground where possible, reducing the need for poles. It is worth remembering, however, that in 1844 when Samuel Morse started to build the first telegraph line between Baltimore and Washington, D.C. he first laid the wire underground. On testing it he found so many faults that he dug it up, bought poles, and strung the wires overhead for ease of maintenance. Whilst they might currently be considered under threat, perhaps we should not yet write off the poles populating our streets in, what Parry Williams called, their “glory of austere simplicity”.